THRISSUR, India (CNS) — Catholic leaders in Pakistan protested the Nov. 4 beatings and burning of a young Christian couple accused of desecrating the Quran. “The government has absolutely failed to protect its citizens’ right to life,” said the National Commission for Justice and Peace of the Catholic Bishops Conference of Pakistan in a statement Nov. 5. Pakistani Prime Minister Nawaz Sharif added his voice those condemning the killings. He described the incident as “an unacceptable crime” in a Nov. 6 statement. “A responsible state cannot tolerate mob rule and public lynching with impunity,” he said. “I have directed the Punjab (province) chief minister to show no mercy, and the law should take its course to punish those who are responsible for this act,” he told local media. Jawad Qamar, a police official where the incident occurred, said nearly 50 people were arrested and 600 were charged in connection with the murder. At least one Catholic advocacy group expressed doubt about the arrests and charges. “How can they charge 600 people for the killing? The trial will not reach anywhere,” Michelle Choudhry, director of Cecil & Iris Choudhry Foundation, told Catholic News Service. “This is the umpteenth time that crowds have been provoked on religious sentiments to settle personal scores and dispense mob justice. Crowds and police are repeatedly setting precedents for street justice, which violates the constitution and the penal code of Pakistan,” the foundation said in a statement. The couple had three children, according to family members. The victims’ bodies were burned at the brick kiln where they worked in Kot Radha Kishan, a town in Punjab province. Blasphemy is a sensitive issue in Pakistan. Critics have charged that blasphemy laws often are misused to settle differences and that minorities are unfairly targeted. Six brothers of the Masih family, including the youngest, Shahzad, worked at the brick kiln, a family member told Catholic News Service. The couple “was brutally tortured and burnt alive,” Shabhaz Masih, Shahzad’s older brother, said. He said Shama was burning waste after cleaning the home of her father-in-law, Nazar, who died Oct. 30. The manager of the brick kiln claimed to have seen pages with Quranic verses in the rubbish and alerted local Muslim leaders. Word of the discovery spread on loudspeakers in neighboring villages, Shabhaz said, explaining that his brother and his wife tried to flee, but the owner of the kiln confined them in a room at the business. Early the next morning, hundreds of Muslims descended on the village in tractor trolleys and motor bikes, he said. “The mob broke the roof, pulled the couple out and tortured them. They were paraded naked and set on fire,” Sardar Musthaq Gill, a Christian lawyer, told CNS. Although several police officers were present, they “could not control the mob,” he said. The NCJP said it was concerned that non-Muslim Pakistanis received inadequate protection from the government. “The perpetrators involved in such incidents have never been brought to justice due to lack of political will. 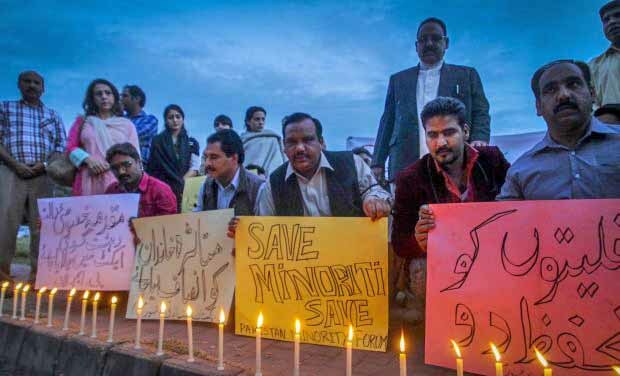 It makes minorities further vulnerable and a soft target,” Father Emmanuel Yousaf Mani, NCJP director, said in the statement. We do not know how well we have it in the USA. I pray for all our Christian brothers & sisters.